Kazakhstan's law-enforcers had a busy summer: it began with the country’s first ever suicide bombing in May, and continued with sporadic deadly clashes between security forces and armed suspects. Officials at first resisted linking the incidents to terrorists. But now, after months of denials, authorities are acknowledging an extremist threat, primarily in the country’s energy hub. The latest twist in the summer-long saga occurred August 29, when law enforcement officials announced they had foiled a plot to carry out terrorist attacks in the Atyrau Region, an oil-rich area in western Kazakhstan. One suspect was killed during a police round-up operation. Twenty-two suspects were arrested on terrorism charges, and two more are in detention under investigation. They are suspected of having links to an unnamed terrorist organization based in Pakistan and accused of making explosive devices using information downloaded from the Internet. The August 29 announcement of a terrorist plot signified a departure from insistent official statements that the string of suspicious incidents – including the suicide bombing, a car explosion in Astana, and armed clashes between suspects and security forces – had no terrorist link. The suicide bombing on May 17 was blamed on a criminal with a grudge against the National Security Committee (KNB), Kazakhstan’s security service, whose headquarters the bomber targeted in the oil city of Aktobe. A week later, a car exploded in Astana outside a KNB facility, killing the vehicle’s two occupants. Officials ruled out terrorism, but offered no coherent explanation for the blast. On June 30, two police officers were murdered in Shubarshi, a village 250 kilometers from Aktobe. That incident prompted a security operation that ended in a shootout in which nine suspects and two more law-enforcement agents were killed. Officials again denied a link with extremism, offering the arcane explanation that the group had been committing crimes using religion as a cover. Shortly afterwards a police officer tracking a suspect in Aktobe was shot dead from inside a house, in which a man then blew himself up. These incidents left a combined death toll of 19 -- five members of law-enforcement agencies, 11 suspects, one suicide bomber and two occupants of the exploding car. Astana positions itself as a bastion of stability and – anxious not to rattle foreign investors, many of whom have interests in the energy sector in western Kazakhstan – officials are keen to preserve this image. 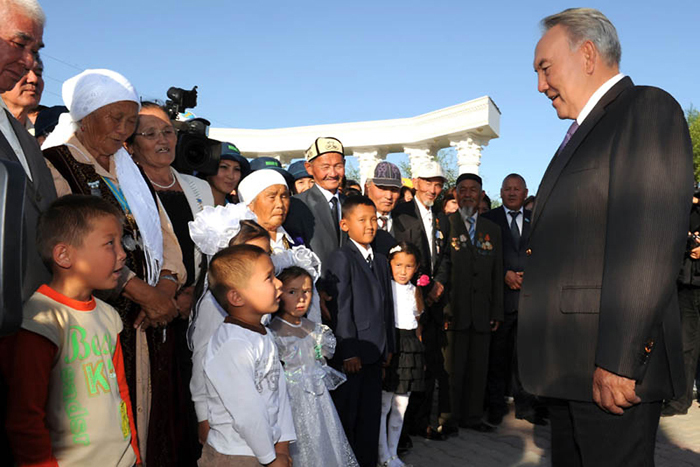 “It is about protecting the state from religious extremism,” Nazarbayev stressed. Astana is already blocking 51 websites deemed to contain extremist content, including – controversially – the LiveJournal blogging forum. As Kazakhstan clamps down on radicalism, some observers say Astana should proceed cautiously in order to avoid repeating the mistakes of neighboring Uzbekistan. Faced with a rising tide of Islamic radicalism in the late 1990s, Tashkent responded with heavy-handed repression that ended up driving more Muslims into the arms of extremists. Historically, Kazakhstan has virtually no tradition of radical Islam, and this is the first time it has faced a threat from homegrown extremists. Observers say radicalism is being fuelled by social disaffection – particularly in the west. Oil-rich Kazakhstan is the wealthiest country in Central Asia, but not everyone has profited from the energy boom over the past decade. In the west, where living conditions are often harsh, there is resentment over a perception that the regions that fuel that boom do not benefit sufficiently from it. This disaffection is coupled with a rise in “pseudo-religious ideological drilling” of young people, Madina Nurgaliyeva, a researcher with the Almaty-based Institute of Political Solutions (IPS) think tank, said in comments published by the Russian news agency Regnum on August 26. This, Nurgaliyeva suggested, has turned western areas of Kazakhstan into “a hotbed of tension.” According to an IPS poll published in mid-August, 55 percent of inhabitants of western regions believe a terrorist attack in Kazakhstan is probable, higher than the national figure of 31 percent. All this talk of terrorism sparked scare-mongering that a major Beslan-style attack was being planned in Kazakhstan. Almost 400 people, most of them young students, were killed in the 2004 hostage crisis in Beslan, Russia. In the western oil city of Aktau, some parents kept their children away from celebrations marking the start of a new academic year on September 1 due to rumors of an attack, KTK TV reported.